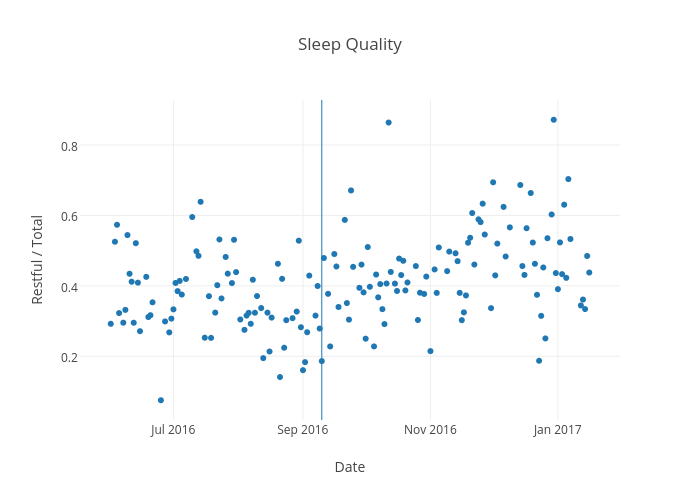 Alexzheng's interactive graph and data of "Sleep Quality" is a scatter chart, showing Restful / Total; with Date in the x-axis and Restful / Total in the y-axis.. The x-axis shows values from 2016-05-17 16:40:15.5301 to 2017-01-30 07:19:44.4699. The y-axis shows values from 0.017864607672761268 to 0.9290093173358387.